This upcoming rugged convertible tablet with detachable keyboard will be loaded with Windows 10 and will be powered by an Intel Core M Skylake processor. Last week, Panasonic unveiled a new Toughbook convertible tablet with Windows 10 Pro and updated hardware. The upcoming Panasonic Toughbook 20 is a rugged convertible with a detachable keyboard that has been designed to be used in tough conditions by the police and military, but also by various professionals working on the field. Civilians looking for a sturdy portable that can take much punishment can also find it suitable, as long as they can live with the price. Panasonic unveiled that the Toughbook 20 will be powered by a Skylake Intel Core vPro processor coupled with 8 GB RAM and 128 GB of internal SSD storage. While Windows 10 Pro is the standard operating system offered with new machines these days by virtually all manufacturers, a downgrade to Windows 7 Pro option will also be available. The detachable tablet weighs 2.1 pounds while the entire convertible has 3.9 pounds. Connectivity options include GPS, LTE, as well as a magstripe or barcode reader. 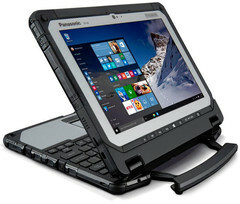 The magnesium alloy case is waterproof, and the Toughbook 20 meets military standards for electromagnetic interference and resistance to drops and extreme temperatures. As mentioned earlier, it all comes with a price - the base version Toughbook 20 is expected to cost $3,099 USD.